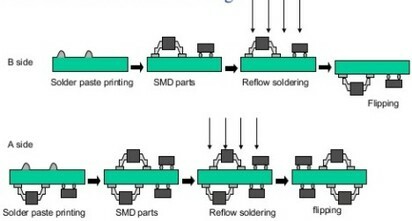 Most surface mount components will be held in place by the surface tension of the liquid solder alone when run through the re-flow oven inverted. The weight limit of the parts that can be processed on the underside during reflow is related to the pad area. This is approximately 30g per square inch of pad area before the component will actually drop.